KIEV, Ukraine -- Ukraine says it will prosecute two men it claims are elite Russian soldiers captured fighting in eastern Ukraine. Ukraine says it also seized rifles made for use only by Russia's special forces. The two wounded men were seized in the town of Shchastya, almost 30km (19 miles) from the Russian border. The head of Ukraine's security service has told the BBC there is proof the men are Russian troops. Russia said the two men were no longer serving soldiers. Rebels in eastern Ukraine said the men were policemen from Ukraine's Luhansk region. 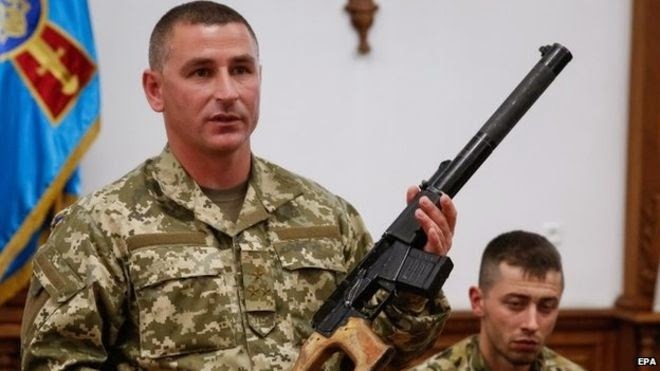 Vitaliy Naida, Ukraine's security chief, told BBC World News he was "absolutely positive" the men were officers from the GRU, the foreign military intelligence branch of Russia's army. "We have battle dress uniform, we have automatic rifles that are produced only in the Russian Federation only for Special Forces' use," he said. Mr Naida said the men were part of a group of 220 GRU officers deployed to Luhansk on 2 May. The others have now returned to Russia, he said. "We have already started a criminal case for a terrorist act," Mr Naida said. In a video, one of the captured men said he was a sergeant from the central Russian city of Togliatti, where an elite intelligence unit for the Russian army is based. Igor Konashenkov, a spokesman for Russia's ministry of defence, said the two men were not serving soldiers at the time they were detained. Konashenkov said the two men had been mistreated by Ukrainian special forces who had "beat convenient testimony out of them". "We are counting on the Ukrainian leadership to show good sense," he said, adding that he hoped the two men would be "released as soon as possible". Moscow denies the claims, but says that a number of Russian nationals are fighting with the separatists in Ukraine's eastern Luhansk and Donetsk regions as volunteers. Pavlo Klimkin, Ukraine's foreign minister, told reporters that Russian officers had tried to kill the two men as soon as they were detained. Mr Klimkin declined to give more details. More than 6,200 people have been killed in fighting that began in April 2014 when rebels seized large parts of the Donetsk and Luhansk regions. The lull in the conflict in eastern Ukraine since February's ceasefire has been punctuated by frequent violations.